Fairfield senior Kami Magee (12) uses one fist to hit the ball during a volley in the first set Tuesday at Fairfield High School where the Lady Lions took on the Fayetteville Lady Rockets in SHAC volleyball action. LEESBURG – An already raucous crowd at Fairfield High School on Tuesday reached a crescendo when Kami Magee set the ball and Layla Hattan spiked it for the final kill and point of the Southern Hills Athletic Conference volleyball match between the Lady Lions and Fayeteville’s Lady Rockets. The straight set win, 25-6, 25-17 and 25-14, secured an undefeated SHAC season for Fairfield and earned them the coveted gold ball trophy that is awarded to undefeated league teams. This is the first undefeated SHAC season in Lady Lions volleyball history. Along with securing the gold ball and an undefeated SHAC season the Lady Lions also celebrated senior night by honoring Magee, Lauren Arnold and Kaiti White. Another highlight for Magee was when she recorded her 1,000th career assist in the third set, play stopped and she was awarded a game ball for the achievement. Even more amazing is the fact that she recorded her 500th career assist earlier this season and has recorded more than 500 assists in her senior season alone. “She was close to 500 when the season began. Last week I started adding them up and I thought she already has almost 500 this season. I couldn’t believe it. The hitting has been a lot more consistent than in the past few years. That helped her out tremendously to get her assists,” said Lesley. The Lady Lions took control of the match early in the first set as the jumped out to a 7-1 lead on the strength of their service game as Magee recorded two aces in a 5-0 match opening run for Fairfield. Hattan was next to serve and led the Lady Lions to a 9-1 lead before Fayetteville was able to gain possession briefly. 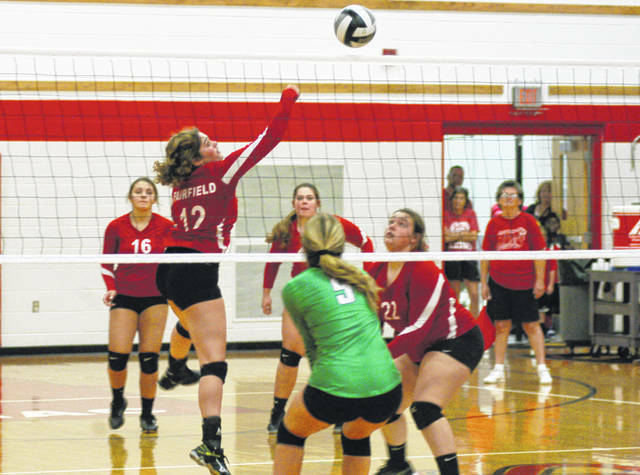 Fairfield allowed only six points by the Lady Rockets in a dominating set one performance. The second set saw the Lady Lions start slowly and Fayetteville took advantage as they hung around and eventually tied and took the lead at 16-14. Fairfield responded as Ally Davis took control of the Lady Lions serve and led them to nine consecutive points and a commanding 24-17 lead. A kill by Magee ended the match during the next volley and Fairfiield had a 2-0 lead going into the third set. The Lady Lions took care of business in the third set as White, Arnold, Layla and Grace Lawson were all beneficiaries of Magee assists in the set to propel Fairfield to the 3-0 win. The Lady Lions will take the floor again Tuesday, October 16, when they host sectional tournament play. https://www.timesgazette.com/wp-content/uploads/sites/33/2018/10/web1_Fairfield-vs-Fayetteville-VB.jpgFairfield senior Kami Magee (12) uses one fist to hit the ball during a volley in the first set Tuesday at Fairfield High School where the Lady Lions took on the Fayetteville Lady Rockets in SHAC volleyball action.